If I want to hang foil stars from the ceiling, do I fill them with air or helium? And can I use fishing wire to attache them to the ceiling? You would fill them with air, and then use either fishing line (monofilament) or ribbon in matching colors to attach them to the ceiling. Unless there's already a bunch of hooks in the ceiling, you also need a way to attach the strings to it. Try Glue Dots or Glue Lines adhesives. Make sure to buy the removable version, not the permanent one. 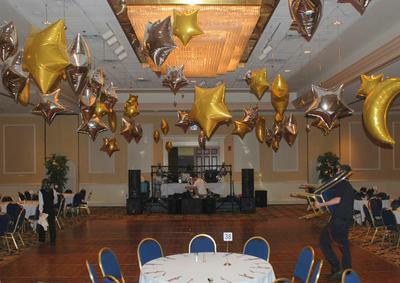 If the venue owner doesn't want you to attach anything to the ceiling, then you could fill the balloons with helium and have them float up to the ceiling. The drawback with this solution (apart from the cost for helium) is that you cannot arrange the balloons as you'd like. Hello - this is my work and there are no pins involved. Keep it simple. Senior prom at the Sheraton in Leominster MA. I am not quite sure what you mean with a straight pin? Anything where you can securely attach the fishing line or ribbon should do fine. Could you use a straight pin in ceiling tile? If the venue has any kind of metal above use magnets with monofilament.